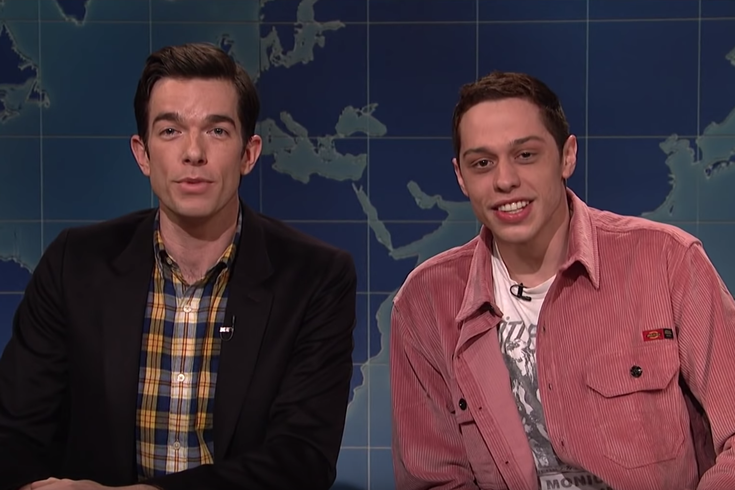 John Mulaney (left) and Pete Davidson on a recent episode of SNL. Pete Davidson and John Mulaney’s upcoming stand-up comedy performances at the Easton State Theater have been postponed. The performances, which initially were set for the night of Feb. 23, have been rescheduled to March 31, according to the Morning Call, because of a scheduling conflict. Tickets for the second of the night’s two shows, scheduled to begin at 10:00 p.m., are still available on StubHub. This isn’t the first time the comedy world’s current Odd Couple has postponed a Pennsylvania performance. Just weeks ago, a Jan. 20 show with the duo was moved to March 16 because of bad weather in Wilkes Barre. The two have each had a busy last year. Mulaney, 36, won his first Emmy in 2018 for his Netflix special, “John Mulaney: Kid Gorgeous at Radio City”. His comedy style is built mainly around a squeaky-clean image and mundane observational humor. Davidson, 25, has worked on SNL since 2014 and was engaged to pop star Ariana Grande last year before their relationship ended in October of 2018.